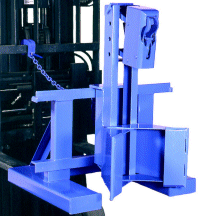 for handling up to a 2500 Lb. to lift, move, palletize and stack drums with your fork truck. 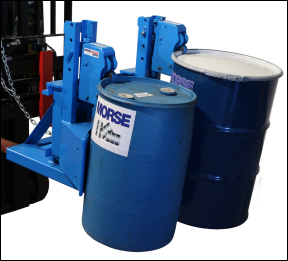 Forklift drum movers for your rimmed drums. 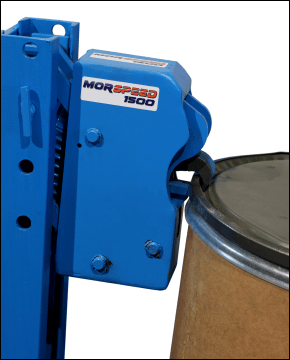 MORSPEED 1500TM forklift drum grabbers / movers are a safety conscious way to handle your drums. The jaws of MORSPEED 1500TM forklift attachments are contoured to securely grasp various rimmed drums. Precision gripping mechanism is built to last. 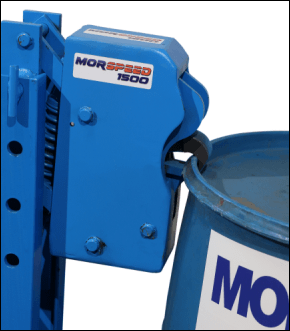 MORSPEED 1500TM forklift drum movers handle virtually any rimmed drum, regardless of diameter. 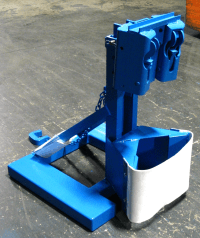 These forklift drum grabbers require that the drum lid be in place on your drum. Move drums with damaged sides or straight walls. 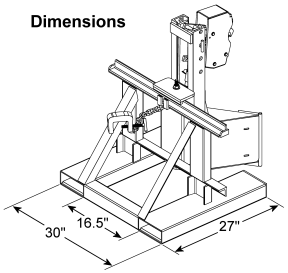 Works with or without pallets. Requires 16.5" (41.9 cm) between forks, as fork pocket openings are 16.5" apart. Each fork pocket opening is 2.5" (6.35 cm) high by 6.5" (16.5 cm) wide. Single MORSPEEDTM head requires a minimum of 75 Lb. (34 kg) per drum to begin the gripping action. Double MORSPEEDTM heads with 2 sets of jaws require minimum 350 Lb. (159 kg) per drum. 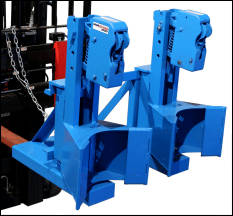 Grab, lift, move and place drums without the operator leaving driver's seat. MORSPEED 1500TM forklift attachments mount on forks in seconds without any tools. 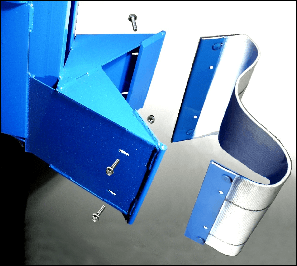 Fork pocket openings are 6.5" (16.5 cm) wide x 2.125" (5.4 cm) high and 16.5" (41.9 cm) apart. Raise and lower forks to actuate the drum grab... No manual contact with the drums. 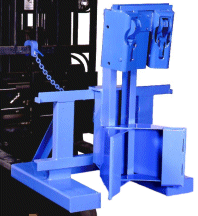 Completely Mechanical and Automatic drum grab requires no power source. Massive steel jaws of the MORSPEED 1500TM forklift attachments are contoured to securely grasp drum rim. Belted backrest pad equips MORSPEED 1500TM drum grabber forklift attachment with a 12" (30.5 cm) wide cotton-based fabric belt. It contacts the side of your drum to help protect the drum sidewall from being marred in handling. The belt is sold as a bolt-on kit. 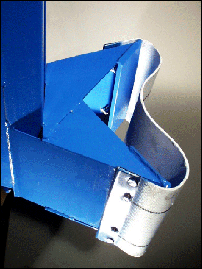 Revision of spring placement provides greater durability and reliability. 288-1 1 1 1500 Lb. (680 kg) 75 Lb. (34 kg) 267 Lb. (121 kg) L37 x W33" x H37"
287 1 1 1500 Lb. (680 kg) 75 Lb. (34 kg) 138 Lb. (63 kg) L38" x W25" x H21"
287-2H 1 2 1500 Lb. (680 kg) 350 Lb. (159 kg) 186 Lb. (85 kg) L37" x W23" x H21"
2523-P Belted Backrest Kit - Install one Belt Kit for each drum position 5 Lb. (2.3 kg) L17" x W10" x H10"
2839X-P Crate for export, fully enclosed, heat treated and certified IPPC compliant 200 Lb. (91 kg) L42" x W36" x H42"
MORSPEED 1500TM forklift attachments to lift, move, palletize and stack drums with your fork truck. Drum grabbers. 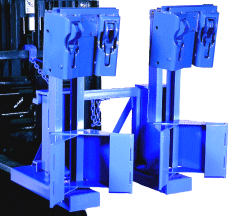 Forklift drum movers for rimmed drums.